For the second time in just over a year I have escaped the Federal Government trying to seriously harm me by putting important safety features on products that do not need them. 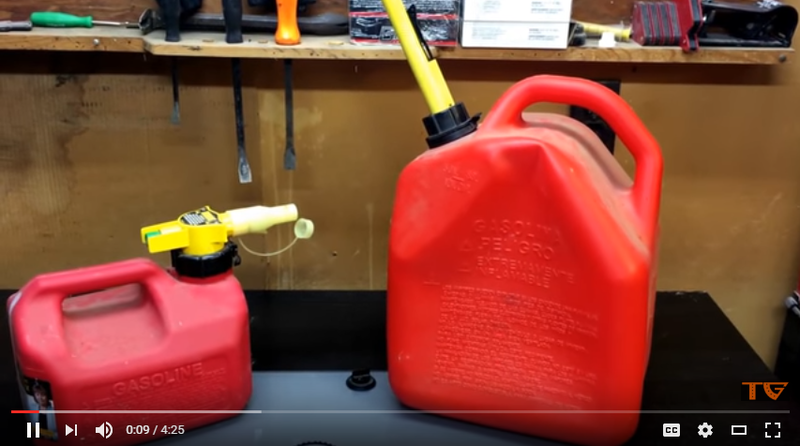 This applies if you own a fuel can similar to the one on the right. The can is designed so that you can not pour fuel unless it is inserted in the tank, inverted and the lock gets depressed by the neck of the fuel tank on whatever you are trying to fill. There is no release valve on the can at all. So as part of the Mama Day honey do list I was pressure washing the moss and gunk off the patio when it was time for a refuel. Hot Alabama sun combined with fuel can makes for pressure in can. The can was almost empty so I figured it might just be a little spurt. I was wrong about that. As soon as the lock released the remainder of the fuel spewing out of the tank (imagine hitting a spoon with a water flow) and about five feet in the air drenching me in the face. I wear eye protection when I pressure wash and I highly recommend this for everyone. Still the rest of the face was coated soaking whatever hair was on my face, head, eyebrows etc. Keeping my eyes shut I wandered back in to the house and gave the face a good wash down followed by a shower. My eyes did not like this and are bright red but no serious harm done. No eyepro and it would have been a bad day. Don't get me wrong; I'm right there with you on the whole topic of government-mandated "safety features" that render the humble gasoline can an abject exercise in "Hey kids! Let's slosh highly volatile fuel everywhere except where you intend it to go!" But can you clarify what mandated feature allowed this to happen? Is it the lack of a secondary release valve (what I call a vent cap)? Just trying to understand exactly what happened because, yes, I have a can very similar to the one on the right. I guess I didn't realize that infernal safety interlock mechanism from bloody hell actually sealed the can tightly enough to allow it to pressurize to that degree on a hot day. BTW: glad to hear you escaped serious harm in spite of the federal government's best attempts to kill you. And no, I don't have strong feelings on this topic. majorhavoc wrote: Don't get me wrong; I'm right there with you on the whole topic of government-mandated "safety features" that render the humble gasoline can an abject exercise in "Hey kids! Let's slosh highly volatile fuel everywhere except where you intend it to go!" I'm guessing the lack of vent hole, because my cans do the same thing if I don't mash the "safety valve" thing they'll sorta belch up gas if I last opened 'em when it was hot. But one of 'em I punched a like 1/16" hole in (auged out with a pocketknife), and it doesn't do that anymore. It is the lack of a vent hole. I have the same can and had exactly the same thing happen, except I got my hands and arms covered. I have seen others poke a small nail hole in the back end of the can to allow the gasses to vent. I guess I will be doing that today. To bypass the "safety feature" and make the can behave like my older cans I broke off the stopper inside the can. It will pour like my older blitz ventless cans now. Zed Hunter wrote: To bypass the "safety feature" and make the can behave like my older cans I broke off the stopper inside the can. It will pour like my older blitz ventless cans now. Likely a better option. I can always cap the nozzle. Is it hard to find old simple gas cans? I remember the old metal round 5 gallon cans I kept filled in my VW in College to make it home on weekends. I think it had a shot normal size neck and a smaller neck for letting out air. IIRC. Those must be a mint at garage sales huh?! moab wrote: Is it hard to find old simple gas cans? I remember the old metal round 5 gallon cans I kept filled in my VW in College to make it home on weekends. I think it had a shot normal size neck and a smaller neck for letting out air. IIRC. Those must be a mint at garage sales huh?! It's not just finding them, most of them I'd be worried about what was in it previously and how much algae is in the can. Algae can shut down an engine fast and gum up the fuel system. The "safety" value of no vent is dubious. The stated purpose for no vent was reduce spilled gasoline. Which the new designs actually exacerbate by the uneven flow and propensity for the fuel to be propelled by a pressure build up just as Stercutus experienced. My wife (unfortunately) likes to go to estate sales or as I call them house puke sales. I mentioned to her that if she saw older gas cans with intact vents and spouts to buy them. The net result is that I have a nice supply of the older vented ones generally for less than $3. So check garage sales for older cans. As noted above your should check them and clean them before using them. BTW most of the ones the wife brought home had gas in them. That and there are many you tube videos on ways to fix the broken compliant cans like this one.